Published on 31 May, 2009 in Music by Alastair. 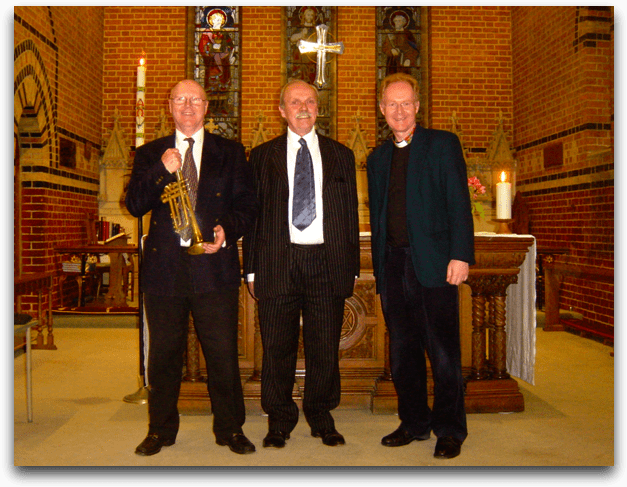 1 Comment Tags: Crispian Steele-Perkins, Ian le Grice, Organ, Trumpet. With a flourish, and a snippet from the Messiah, trumpeter extraordinaire Crispian Steele-Perkins made a brilliant impact in the Trumpet & Organ concert at St. John’s. It was a bit of a journey back, in a way, for Crispian, as he is an ‘old boy’ of Copthorne Prep School; and indeed started his trumpet career at the school (see this photo!). He has done so much session work over the years, you will definitely have heard him play. If nowhere else, on the theme tune to the Antiques Roadshow. With his usual style, incorporating quite a lot of entertaining trumpet history, Crispian played brilliantly. The organ (and piano, and even at one point harpsichord) accompaniment came from Ian le Grice, who having assisted Sir George Thalben-Ball, was later appointed assistant organist at the Temple church, where he still plays. Ian’s subtlety of playing coaxed some delicate sounds out of St. John’s organ, the like of which I have not heard before in over 13 years here. An exquisite combination with the trumpet. The concert was in church on Pentecost evening; and thinking of God’s Holy Spirit, called Ruach in the Hebrew of the Old Testament, meaning ‘breath’, or ‘wind’, seemed entirely appropriate. That, and the entreaty from the psalmist reminding us to Praise God on the trumpet!